Indiana University undergraduate students Allie Hitchcock and Sara Miller began their research on Samuel McClure and McClure’s Magazine after a class visit to the Lilly Library with J450: History of Journalism. They went on to present their work at the Association for Education in Journalism and Mass Communication/American Journalism Historians Association joint conference in March 2018. In this post, Allie Hitchcock recounts their research experience. McClure’s Magazine is remembered in journalism history for being one of the most influential publications to lead the muckraking movement, now more commonly known as investigative reporting. My classmate Sara Miller and I first got interested in McClure’s as students in Media School professor Mike Conway’s Journalism History class and were thrilled to learn that we could learn more about the magazine right here on campus at the Lilly Library. For such an influential magazine, it was interesting to learn that McClure’s struggled through a slow death: Samuel McClure tried to revive it, rename it and rebrand it to no avail over a more than two-decade span. Spending the bulk of our research right in the Lilly Library’s reading room, we read through hundreds of documents between Samuel McClure and the people closest to him to try to understand where this failure came from and how a publication so important to journalism history could struggle so hard. 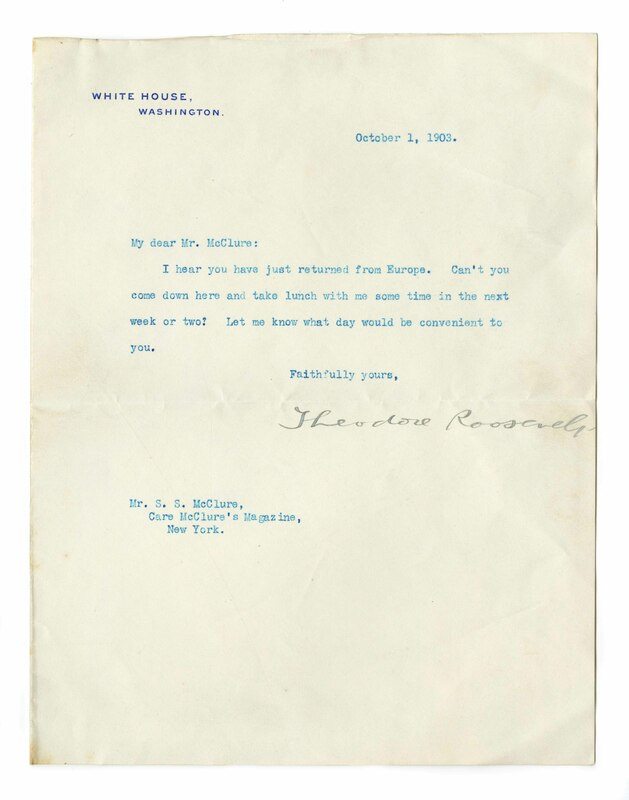 Letter from Theodore Roosevelt to S. S. McClure, October 1, 1903. By seeing McClure’s correspondences with the people around him, we were able to pull out three key conclusions regarding the magazine’s failure, tying back to three key layers of stakeholders in the magazine’s success: grassroots writers on McClure’s staff, editors including McClure himself, and the magazine’s publisher Moody B. Gates. These three layers of constituents had three distinctly different images for the magazine’s needs, priorities and future. Trying to appease all groups brought on instability and challenges to keep the publication’s high level of quality and output in investigative reporting. It was really interesting to see how candid the people surrounding McClure, in both his personal life and professional life, were. These letters were written more than a century ago, but the frustrations and concerns McClure’s family and coworkers had with him and with the future of the publication spoke volumes. 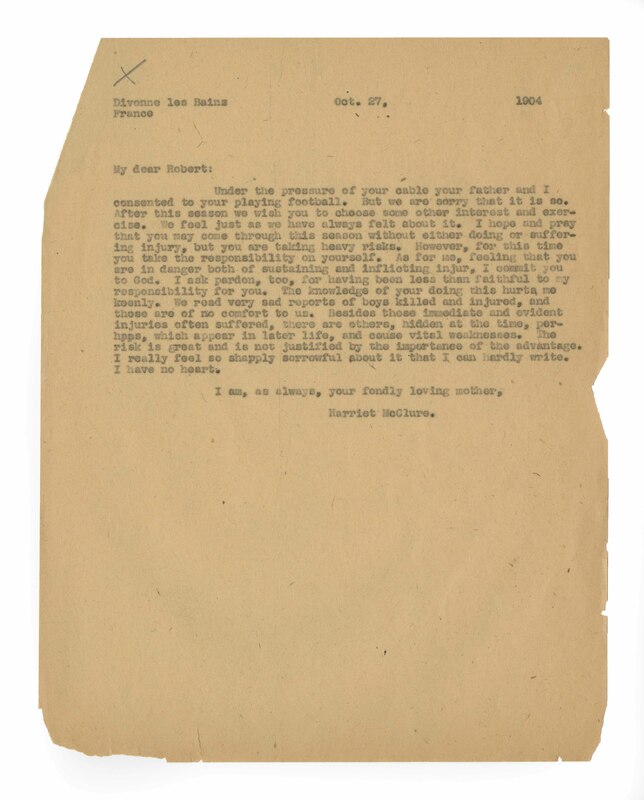 Letter from Harriet McClure to Robert McClure, October 27, 1904. Both financial and editorial concerns came into play. In one letter, McClure’s publisher Gates wrote about keeping the lights off in the office building at night. In another, Rudyard Kipling encouraged McClure to try to keep his visions more narrow, as spreading himself too thin could hurt the magazine as a whole. In one, McClure’s son Robert urged his father not to trust his gut with editorial decisions but to listen more to his staff. It became clear in reading these correspondences that Samuel McClure had a range of concerns at hand, and failing to respond to them all is unsurprising – the demand was massive. Our research came to fruition in March 2018 when I got to travel to New York City and present these findings at the Joint Journalism and Communications HIstory Conference, co-hosted by journalism associations AEJMC and AJHA. It was an amazing opportunity to get feedback on this work and to meet with other journalism historians, and I’m looking forward to continuing our research. That is so cool. The lunch invitation form Roosevelt is amazing. I guess that’s what you did before they had text messages. As an IU grad (Ph.D. 1993) who sifted through all the McClure papers for my dissertation and then first book, on newspaper syndicates, I’m so glad to see others mining this treasure trove. Love the Lilly!